So here’s the finished Spite Walker. I went with a rather muted colour scheme in the end, preferring to bring out the detail using various weathering washes etc. I've always liked obscure looking Walker type vehicles. I guess the first mention of the Stegatank in the original Rogue Trader rulebook really set me thinking. 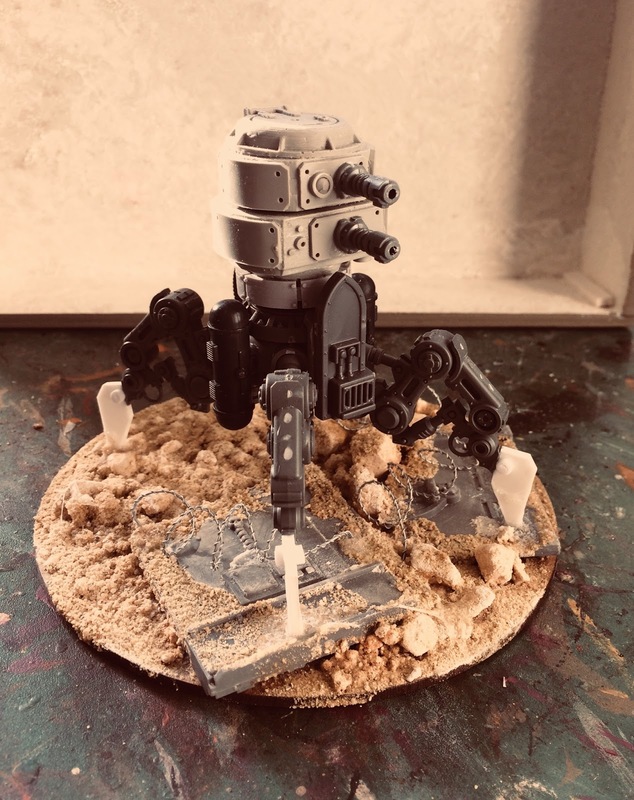 Anyway, the legs structure of the Mechanicum dune walker recently peaked my interest, but I've never liked the body section. It looks a bit top heavy for my liking so I replaced it with something else. 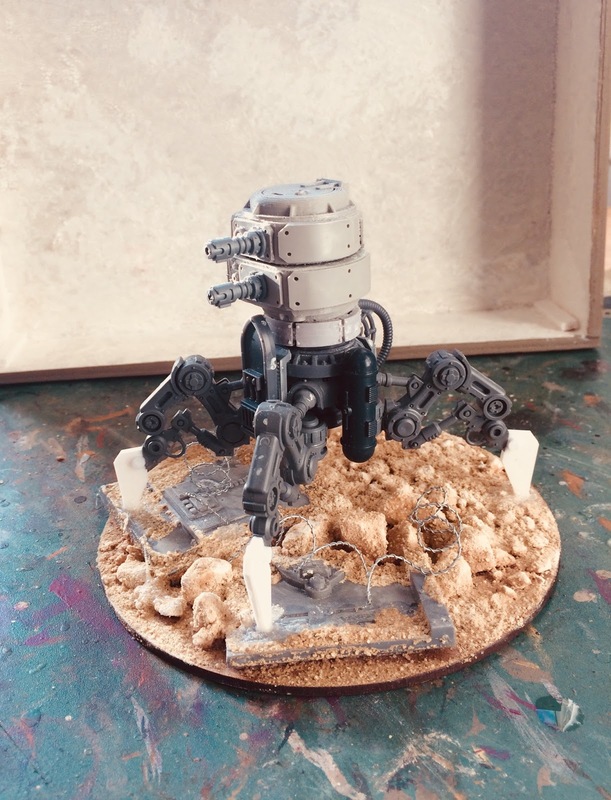 Et voila: a Walker type vehicle for my renegade army, something else found in some obscure storage facility and press ganged back into the service of dark gods. I've always liked the Cadian Hostile Environment Team, just not the heads. These guys are a combination of those, plus Victoria Miniatures legs, arms and weapons. The Skitarri heads finish the look. I had the chance to purchase a few more Zone Mortalis boards recently so I thought I'd do a little spot about how they were painted up. 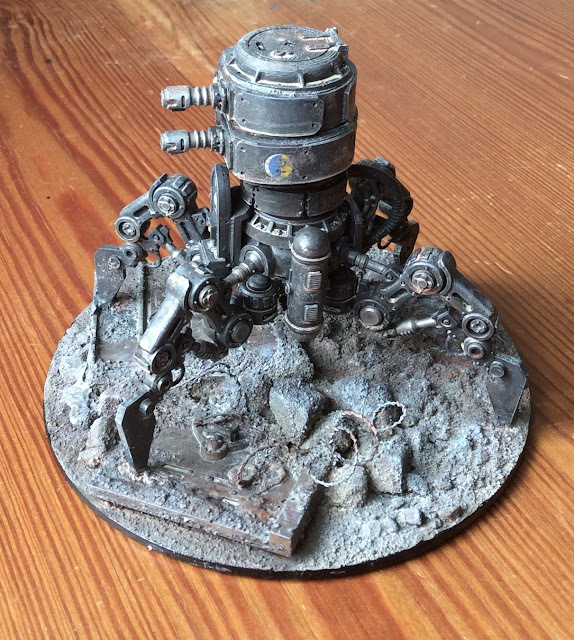 I love the idea of these boards being some kind of Hive Sump, forgotten levels etc, and with the re-release of Necromunda it seemed like a perfect time to get the old rust weathering out and get to work. I started by giving these boards a loose spray coat of Hycote Bronze, dirt brown and a few squirts of light grey. I painted the panels with Agrellan Earth crackle paint and gave this a white wash once dry. 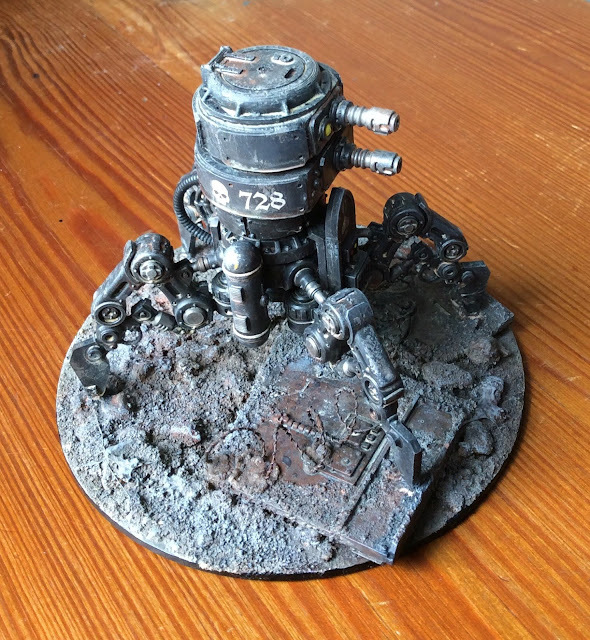 I then added a few industrial pattern touches, hazard areas etc. Then it was onto the weathering. Copious amounts of watered down rust pigment, followed by blobs of wet turquoise, green and black. The whole thing was done quite randomly and looked more like a dirty great puddle when finished. I was more interested in what kind of random effects I could get between the different areas of colour. Not much in the way of conversions for this post, just an experiment I did with a colour scheme. I loved the Lego Custodes models when they arrived but was less than enthusiastic about the gold colour scheme that most go by. Possibly it was my woeful ability to convincingly paint metal that did it, but I decided to go for a different scheme. The metallic sections of these are a gold silver mix, to give a nice patina type, antique effect, washed with Gryphonne Sephia. The grey areas were given a base coat of dark grey, washed with black, then given a dry brush of the same dark grey shade. When the farm quartermaster woke in the night it was to the sound of something large and solid passing through some distant point beneath the ground. An immense head of vibration building like the approach of a Planetary Lighter still far off. In the half-awake, it seemed to him that the storm outside was on the cusp of calling his name. He felt something squirm and buckle inside as a bird trying to escape a sack. The glasses on the nightstand trembled. In the dream from which he had wakened he had been digging. Even now his limbs seemed to ache from the effort. The hole in which he had stood had been deep beyond imagining. The land itself drawing him and others like him into a magnetic embrace of ancient provenance. The odour of electricity and ozone, of stone recently cut and opened. There had been something in the ground with him. A slow tidal heartbeat, ancient beyond understanding, that radiated a dark malevolence and spoke of intelligence beyond words. He had felt scrutinised and impossibly humbled in its presence. An incredible and almost bewildering tranquility. He recognised the field in which the watching crowd had assembled, the ring of standing stones there, raised by those who were long dead to mark the place where a meteorite had come down in pre-colonisation times. The crowd had appeared to be waiting for something. The sense of expectation had been overpowering. He turned, restless with uncertainty, reached out to touch his wife sleeping beside him, found her nestled in her wrappings like some tiny animal, lit with a pale light that gave her the appearance of a fossil, chalky and pallid and freshly turned loose of the soil. Quickly and quietly he rose and got dressed and made his way down to the tool room, took a spade from the racks there, rested it in his hands, assessing the weight of the thing. I'm in the throws of everything Nurgle at the moment. Inspired by Wilhelm's Abalone Mutant I thought I'd try my hand at using a sea-shell as the basis for some kind of Nurgle drone type critter. The shape really lends itself to the god of decay, especially if its been mauled by the ocean a bit beforehand. Wow! It’s been a while. Funny how blogging drops off once life gets in the way. Having said that, I have actually been painting and modelling etc, just not showing off :) Still, with that said, here’s a quick run down of what I’ve been working on. I had the bare bones of this Leman Russ sitting around for months until I finally decided to do something with it. If you don’t have any old lego, get hold of some. It’s a great modelling tool to construct superstructure. I usually use it to create the basic shapes of a model, then plate it completely with plastic-card to hide the ‘bobbles’. Most of my Chimera conversion models have been created in this way. I wanted to create a machine that looked as though it had been stored in mothball for thousands of years, taken out of service by my renegade army. I finally succumbed to the true scale revolution and got hold of a small detachment of Primaris Marines. I’m quite liking the larger look although I’m the kind of anally retentive chap who then says ‘but what about my old scale marines?’ I’m not planning to recreate those that I have already in true scale as I love the Mark 2 Heresy look too. These guys will do for now. They’re intended as some kind of Inquisitorial Kill Team. I spiced them up with a few extra seals, armoured panels and Grey Knight heads etc. So that’s it. Hopefully I won’t leave it so long next time. So I recently came into possession of a box of original metal Kasrkin. I'm not really a fan of the usual Cadian heads so I thought I'd try my hand at the venerable old head swap. Metal is considerably harder to work with that plastic for obvious reasons but I think I managed to get the point across. The heads are from good old Victoria Miniatures and I added the rebreather sections from Vic's backpacks. Quite simple conversions, but I'm not that much of a fan of the usual Cadian look. If GW offered alternative IG heads and backpacks etc, they'd be onto a winner. There's no telling what you can find in the various junk heaps that scatter the Sump. The detritus of the various Spires all ends up as the bottom. As the old saying goes, the grot flows down hill. That is until it reaches the Sump. No wonder so many of the cults around these parts are so well equipped. I swear sometimes that those Spire dwellers have no idea of the wealth that they throw away. I never really liked GW's obsession with Red so I thought I'd use a more muted tone for my Spire Guard. Seccundus is after-all a planet coated in ash wastes and storm driven mud flows etc. Add to that a bit of brass etc and I'm pretty happy with these guys. Although I’m much more of a fan of the more “realistic” takes on the Imperial Guard, I’ve always had a bit of grudging admiration for the Vostroyan models. I think it’s the rebreather thing / Napoelonic inspiration, although I’ve never been happy with the moustache look. To that end I thought I’d grab a pack to represent some kind of higher echelon, Spire Guard for my Seccundus Hive setting. I sawed off the un-protected heads and replaced them with something that I thing looks more fitting. However, the main conversion was with the weapons. I’ve always thought that the combination of ornate barrel and stock etc, and fairly ordinary looking muzzle didn’t quite work with the Vostroyans. I wanted something that looked a bit more in keeping with their style, and hit upon the 15th Century Arquebus. These weapons had very little exposed muzzle at all and were incredibly ornate. To this end I snipped the exposed barrels off and replaced them with watch parts. I quite like the idea that each weapon is a unique construction. Overall, fairly innocuous conversions, but ones that I think add a fair amount of character. With the eventual fate of any gene cult sealed, I liked the idea that as the harvest draws near, the level of fundamentalism within a cult steadily ramps up, eventually leading to a whole class of Neophyte hybrids who believe that they deserve the chance to lead the followers to their promised salvation. These Neophytes will often fight to the death any challenger, and it is for this reason that, once chosen by the cult, they are assigned personal body guards, to ensure that their holy purpose remains steady and pure until the time is right. They are often the best equipped of any cult members and are rarely seen in public until the "big day", even then appearing in masks that hide their true visage. When salvation is at hand and all hope for an infected system is lost, then the Exalted Brethren make their appearance. So here's the latest addition to the Temple of the Lizard. Now that it has been thoroughly taken over by the gene cultists as was originally intended, the Temple can start to show themselves a little more. This chap is intended as a kind of recruiter, travelling the now-conquered hives of Seccundus, gathering followers and leading the hunt for those who have refused the Temple's message and gone into hiding. Three more characters here for the Rogue Trader retinue. I had quite a number of spare bits and bobs lying around after hacking apart that box of Ruststalkers I posted recently. Coupled with a few spare Chaos Cultist legs and torsos and I managed to spin them out into three new Rogue Trader members and a messenger droid. Still can't quite get that flame effect right. These chaps are intended as a small Mechanicum unit attached to my Rogue Trader retinue. They're a basic conversion with only head and arm swaps. Not sure if the photo shows it clearly, but bottom left has a little vestigial arm ready to slam another magazine into his weapon. Here's the latest Rogue Trader henchman. I wanted this guy to be armed with something a little more obscure and toyed for a while with using one of the Chaos Defiler gun mouths on his weapon. Ultimately I thought it looked better as a Melta type device. So I had some time at the weekend to get these three characters painted up. I liked the idea of the Swordsman being armed with two arced-ceramic blades, one dark, the other light. A little Ying Yang idea there. Otherwise, they were all a fairly simple paint job, plenty of wash layers, plenty of highlighting.